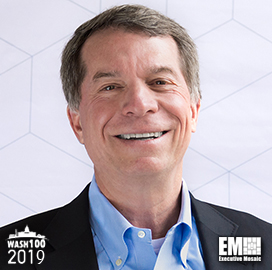 Executive Mosaic is honored to introduce George Wilson, CEO and president of ECS Federal, as an inductee into the 2019 Wash100 — Executive Mosaic’s annual selection of the most influential voices in the government contracting arena — for leading the company to expand its workforce, securing major contracts and growing the company exponentially. This marks Wilson’s second consecutive Wash100 award. Under his leadership, the Fairfax, Va.-based information technology company saw its revenue increase over $600M in 2018 compared to the $100M record set in 2010. Wilson led ECS to expand its workforce by 2,300 employees since he assumed leadership of the company in 2014. As the company continues to expand its presence in the industry, ECS secured spots on major federal contracts in the past year. The company won a spot on a $50B contract from the General Services Administration and another $17.5B contract from the Defense Information Systems Agency to provide IT support services across the government. Wilson said that the contract provided the company new opportunities to serve, particularly the Department of Defense and other federal civilian customers. ECS also announced a series of appointments in the past year as part of its growth efforts, including David West as vice president of corporate development, Joel Angeles as vice president of network engineering and Jackie Fendrock as vice president of business development and operations. West, Angeles and Fendrock will help ECS in the development and implementation of the firm’s growth strategies, managing customer and industry relationships, and in aligning strategy with government market opportunities. Wilson joined ECS Federal in 2011 as the chief strategy officer and became the president and CEO after three years. Prior to joining the company, Wilson was instrumental in growing Stanley Inc. from a small, private business with 20 employees and $2M in revenue into a public company with nearly 6,000 employees and $900M in annual revenue. Also, Wilson serves on the ECS board of directors and is a board member on the Professional Services Council, Brain Injury Services and the Washington Choral Arts. He’s also received a Bachelor of Science in electrical engineering from the United States Naval Academy and a Master of Business Administration from George Washington University. Executive Mosaic congratulates George Wilson and the ECS Federal team for their selection to receive this award.